Just before I left, I decided to skip Albania and Macedonia and go to Israel instead. That meant I didn't have to rush through Bulgaria to get to Turkey. 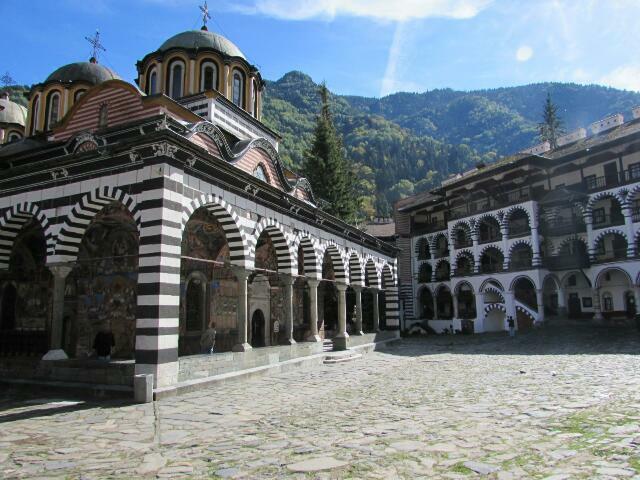 My main objective in Bulgaria was to visit the Rila Monastery outside of Sofia and it was one of the highlights of my trip. Sofia was nice but in retrospect I should have done a hiking trip around the Monastery instead of spending three days in the city. My next stop was Plovdiv and even though I had to drag my ridiculous suitcase up a steep hill on the most cobblestoned street in the world, the minute I walked into the hostel I decided to extend my stay. 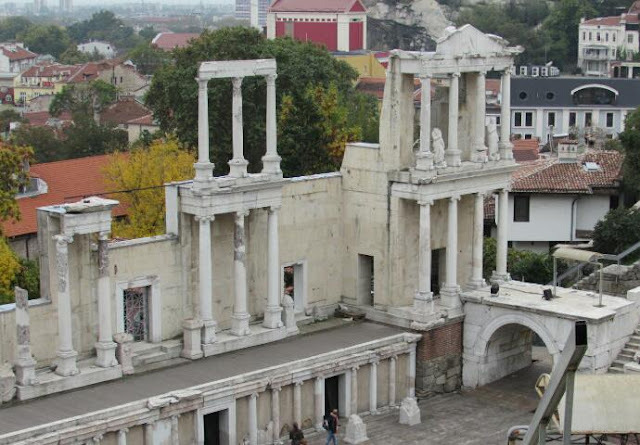 Plovdiv is full of craft shops, art gallaries, beautifully restored homes, and Roman ruins. My hostel was located in a renovated house built in 1868 and it was one of my favorite hostels. My last night in Plovdiv I heard about the "UFO", an abandoned communist structure built in 1981 as a monument/meeting facility. My hostel in Veliko Tarnovo (also located in an 1860's rennovated building) organized trips to the UFO so I signed up and hoped that enough other people would want to go. In the meantime I explored Veliko Tarnovo which was an ancient capitol of Bulgaria. Another city built on hills with a wonderful fortress which was fun to explore even in the rain. 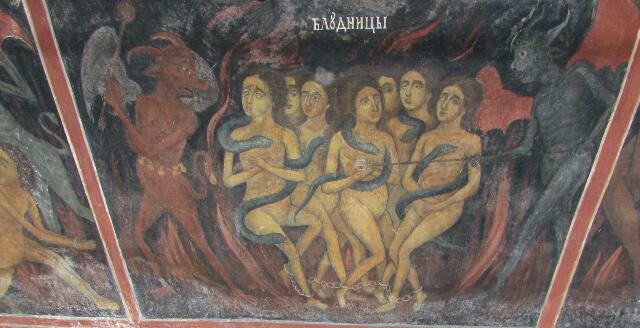 The murals in the main church were fantastic. The hostel was unable to organize the UFO trip so four of us got together and rented a car. It was so foggy and rainy we almost drove right by the building. It is forbidden to enter the structure but there is a small opening in the fence that a person can climb through to gain access. The structure has not been maintained and the interior mosaics of the faces of various Communist leaders have deteriorated. Most of the marble has also been removed and there are holes in the roof. It was absolutely amazing and I am glad I got to see it before it totally falls apart. My last stop in Bulgaria was Varna, a city located on the Black Sea with great bus access to Istanbul. The beach and parks were really beautiful and it was a great place to relax before going to Turkey. • Bulgaria doesn't use the Russian alphabet - Russia uses the Bulgarian alphabet. • Pepto Bismol is not sold in Europe. 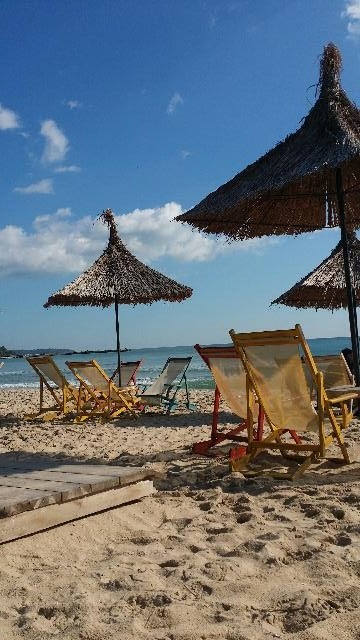 • It is much better to take the train in Bulgaria.